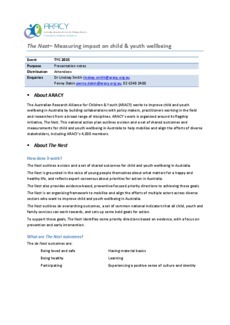 The Australian Research Alliance for Children & Youth (ARACY) Nest Action Agenda outlines a vision and a set of shared outcomes for child and youth wellbeing in Australia: 'All young people are loved and safe, have material basics, are healthy, are learning and participating and have a positive sense of identity and culture'. The Nest Action Agenda is grounded in the voice of young people themselves about what matters for a happy and healthy life, and reflects expert consensus about priorities for action in Australia. It outlines six overarching outcomes and a set of common national indicators that all child, youth and family services can work towards. The Nest Action Agenda is intended to be a resource for the sector, which can help: •	practitioners, agencies and communities see where their everyday works fits in the big picture of children’s wellbeing – and how the work of individuals and communities can contribute to national outcomes •	map how their work contributes to the six outcomes of The Nest Action Agenda and the National, State and local agenda for the youth sector •	create an outcomes focus. Embedding outcomes thinking in the way individuals and agencies work and utilising outcomes as a reporting mechanism shows practitioners and agencies what they’ve achieved – and helps them measure their impact, improve their practice and strengthen outcomes for children and young people. This presentation will explore how outcomes measures and Results Based Accountability (RBA) can be used by organisations to measure, report and inform their efforts to improve outcomes for children and families. The presentation will discuss the ways in which the new NEST/RBA scorecard can be utilised in a range of organisational contexts. An outline of how the NEST action agenda is being utilises in Tasmania will also be presented.